When starting with Arduino, one soon has much more Arduino boards then RS232 or even USB ports on the computer. So that, it seems more useful to put the signal level converter to an external adapter than directly on the Arduino board. Usually, one has (I have) a big basket full of ATMEGA8 and ATMEGA168 with Arduino bootloaders and one idea. 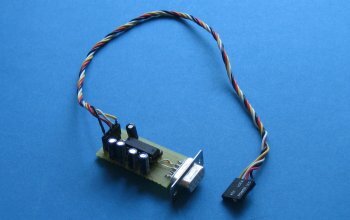 So I need a simple and fast-to-build Arduino board. When the bootloader is already programmed, one does not need the ISP port. 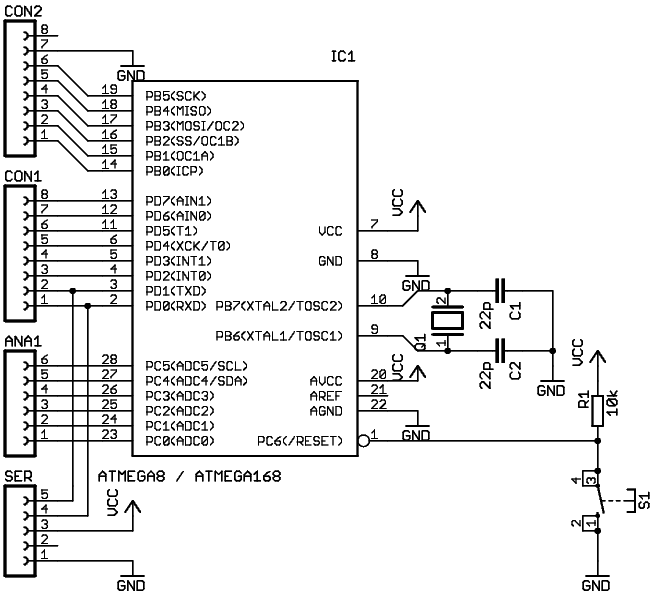 Also, I prefer an external RS232 level converter than to build it on the Arduino board, since then the usage is more flexible. 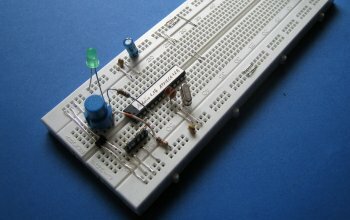 That's how it looks like on a breadboard. 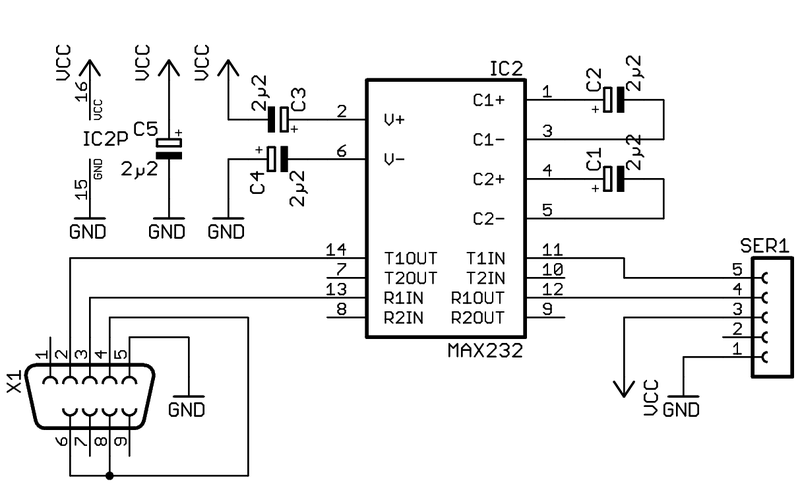 The converter from TTL to RS232 signal level is a simple application of a MAX232 and fits inside a connector's housing. 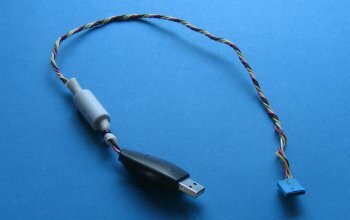 The idea came from  where a CAT-cable for a Sagem mobile was used as CAT cable for a ham radio transceiver. When connected to a PC via CAT, many mobile phone use a serial protocol and TTL signal levels. At many of these CAT adapters, the connexion to the operating system is done with a virtual COM-port. So we may have exactly the thing we want for our Arduino: A COM-port with TTL signal levels via USB. One can get those cables for about 5 Euros. The important thing is that the drivers provide a COM-port. The first thing to find out which is the ground pin. Usually, it's the one having the most connections with the connector. It's not necessarily connected to the ground or shield of the USB plug! Then, plug-in the connector and watch out if one of those pins is a 5V VCC pin. Should be easy to find out with a multimeter, when you know the GND pin. If there are only three wires, you can do without this step :-) . 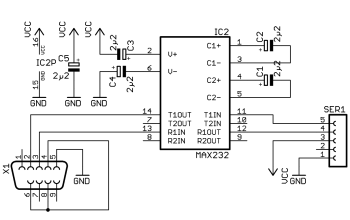 Connect ground to your Arduino. Use a terminal programm (e.g. 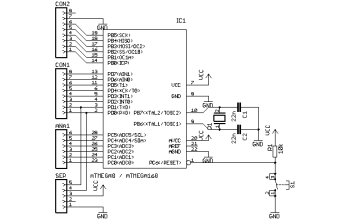 Arduino environment) to the new COM-port. Connect one of the wires to the TX port of Arduino (pin 2). If you can read the message or something weird in the terminal, you found the RX pin. The remaining pin is the TX-pin. 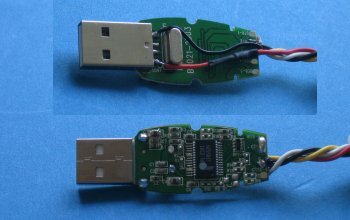 If you want to power the Arduino via USB, you probably have to connect the USB ground to the TTL ground.